STEREO Satellite image of the Sun's coronal arcs. Thermonuclear fusion reactions from deep in the core are said to drive the Sun. It has become so commonplace an assumption that most solar physicists say, "What else could it be?" "I am aware that many critics consider the stars are not hot enough. The critics lay themselves open to an obvious retort; we tell them to go and find a hotter place." According to spectrographic analysis, the Sun is composed primarily of hydrogen gas (71%), with 27% helium and the remainder thought to be minute percentages of oxygen, nitrogen, sulfur, carbon, and six other elements. Although every element on Earth can be seen in a spectrogram of the Sun, those 12 make up 99.9% of its mass. The Sun is 1,390,000 kilometers in diameter, with a mass approximation of 1.98 X 10^30 kilograms. The temperature measured at its surface is 5800 Kelvin and is estimated to be as high as 15,600,000 Kelvin in the core. As conventional models suggest, the Sun must generate outward radiation pressure or gravity would compress it into a relatively tiny, solid ball. The theory states that an energy source must exist inside the Sun, acting as a counter force to gravitational contraction. It seemed to Sir Arthur Eddington in his classic work, The Internal Constitution of the Stars, that only nuclear fusion could produce radiative energy sufficient to prevent the Sun from collapsing "under its own weight" and last for billions of years. Since the processes by which scientists describe those fusion reactions were not mathematically modeled until years after Eddington's theory, it was more a statement of faith at the time than it was a result of experimental research. Hypothetically, how does the Sun produce heat and light enough to sustain life on our planet at a mean distance of 149,476,000 kilometers? When the Sun condensed out of the nebular cloud that is supposed to have been its nursery, the gases were compressed by gravity until they reached temperatures greater than ten-million Kelvin. At that temperature, hydrogen atoms are disrupted into individual protons and electrons, leaving the protons free to collide with one another. It is these initial proton collisions, it is said, that are the first step in a reaction called the proton-proton (p-p) chain. When protons collide at those high temperatures, they are moving fast enough to fuse into other particles: deuterium, a positron and a neutrino. Deuterium is a proton-neutron combination, while a positron is a positively charged electron. Neutrinos are similar to electrons, except they do not carry an electric charge, and are almost massless. Being neutral, they are not affected by the electromagnetic forces that affect electrons. The second stage in the p-p reaction is the formation of a helium-3 nucleus when the deuterium captures another proton, while at the same time emitting a gamma ray. A helium-4 nucleus and two neutrinos are the end results of the reaction, although it can follow one of many different reaction paths. In reality, as Electric Universe theorist Wal Thornhill points out, stars reside within plasma sheaths perhaps as great as a light-day in extent. They are the borders between the electrical influence of the stars and the currents flowing through the galaxy. The stars receive their power from outside, not inside. 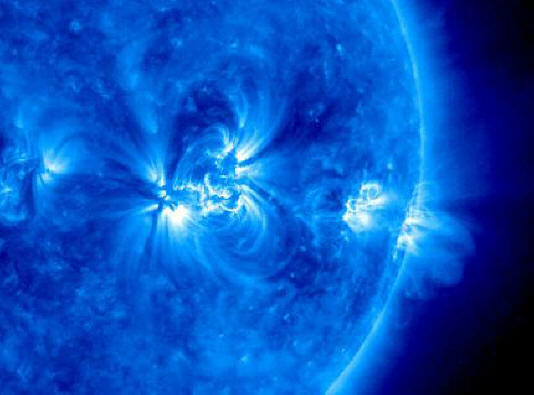 Any nuclear reactions are taking place on the surface of the Sun and not in its core. The solar wind is an electric current connecting the Sun with its family of planets and with its galactic clan, so the 90-year-old theory of fusion firing the solar furnace needs to be reexamined.